Time saving & Easy Transport on soft case. Guitar PedalTrain not adapted for Keyboard player, the height is too large for sustain pedal. Don’t search your pedals under the keyboard, they are all fixed. Have reflexes because pedals always remain in the same place. Lightweight and resistant, the wood composite doesn’t rot. Car Carpet to adheres pedals and other with velcro. Apply Neoprene Glue over the entire surface. Fix Electrical Power Strip in the right direction to plug up transformers and electrical outlets. You will use only Hook under your pedals, Loop is the carpet. Position your items wherever you want. I fix the sustain pedal to the right center, under the A4 note of the keyboard like a real piano to keep the same benchmarks. You should have a fairly large keyboard stand to fit the pedalboard. Great Job Mac ! Nice tip to place sustain pedal to the left to release the right food. Is your page available in English for people like me who do not read German? Nice pedal board, although I’d be a bit concerned about kicking my audio interface with it down there. I created one for 4 pedals that fits a standard maplin flight case but I just overlapped the carpet to the other side instead of the nice metal surrounds you have used. With this number of pedals I assume you also play in socks! No Socks, Matt ! I can keep my shoes with my size (42) ! 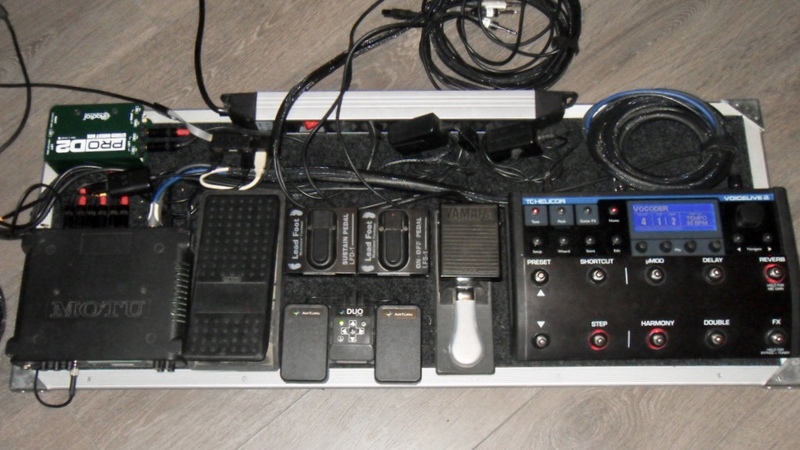 Why don’t you post a picture of your pedalboard to share your user experience? Don’t have a great photo to hand but see attached! Here’s my standard 4 pedals below. Sustain, advance and two volume. Also an octave of bass pedals for some long held notes. Thanks Matt , Nice Rig !